Flowerama delivers flower arrangements, Roses arranged in a vase, Get well flowers and more to Gahanna, OH everyday of the week. We are Gahanna's local florist, and we have won multiple awards for our quality service, quality flowers and fair pricing. 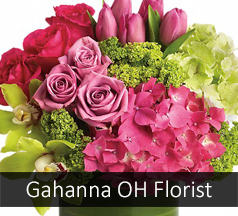 We offer same-day flower delivery and express flower delivery options to Gahanna. The signature arrangement Flowerama created for Gahanna is called "Head Over Heaels Gahanna". Order flowers online, visit one of our flower shops near Gahanna, use our mobile site or simply call, which ever way you choose we make it easy and convenient to send flowers to your loved one in Gahanna.